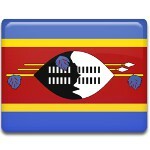 On April 25, Swaziland celebrates National Flag Day. It is considered an official public holiday in the Kingdom of Swaziland. The flag of Swaziland is based on the military flag introduced by King Sobhuza II in 1941. The king gave it to the Swazi Pioneer Corps in order to remind them of the country's military traditions. The flag was hoisted for the first time on April 25, 1967, when the king took the pledge of oath. The anniversary of this event is now celebrated as National Flag Day. The flag was officially adopted on October 6, 1968, a month after the independence of Swaziland from the United Kingdom had been proclaimed. The flag of Swaziland is comprised of three horizontal stripes. The top and bottom stripes are blue, they stand for stability and piece. The central stripe is red, it stands for past battles. The red stripe is edged with two thin yellow stripes for the country's resources. In the center of the red stripe, there is a black and white shield. The shield is the symbol of protection from enemies, while its colors stand for peaceful coexistence of black and white population of Swaziland. The shield lies on two spears and a stuff decorated with feather tassels, which symbolize the royal power.